We had a fabulous evening viewing Saturn’s rings on Friday 5th October. We had about 40 visitors to our special World Space Week event. The first star to appear was Vega which young astronomer Lily pointed out. She quickly got out her astronomy book to find out which constellation it is in – Lyra. We saw Jupiter setting low in the horizon but we were too late to see the Galilean moons. The Summer Triangle of three stars each in a different constellation were next to show themselves – Vega, Deneb and Altair. As the evening went on more and more stars appeared and we could easily see the Milky Way. At 7.25 the International Space Station went over our heads. Astrophysicist Natalia Garrett did her best to answer questions from a 4 year old – not easy to put some concepts into simple everyday language. She brought her telescope and software which builds up a more detailed image over time. Thanks too must go to Andrew, Nicholas and Martin for bringing their telescopes. Altogether a fantastic experience. Speaking of the International Space Station three pupils from St Joseph’s primary school enjoyed listening in to astronaut Alexander Gerst as he passed over their school on Tuesday 16th October. However I felt sorry for the children in Belgium who didn’t get a chance to ask their question. He only answered 8 out of 21 questions as he spent too long on each one! Alice was horrified when I told her that astronaut Serena is the only woman on board with 5 men! 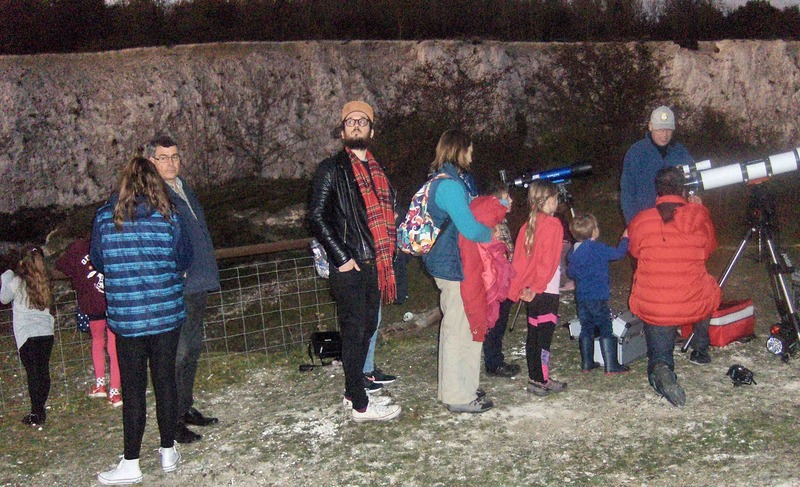 On October 20th the Monkton Stargazers joined astronomy groups around the World to celebrate International Observe the Moon night and had a fantastic time! Lots of people turned up to see the craters on the Moon. There were cries of ‘Oh Wow!’ and ‘we must come again soon’. Luigi of f1telescopes in Sittingbourne brought one of his telescopes which soon generated a queue! Lily Head is our Lunar expert and she set up her display about the Moon in the cafe of the Reserve. She is pointing to four possible sizes of the Moon in relation to the picture of the Earth above but which one is correct? She also explained how craters were formed on the Moon using a tray of sand and marbles. There were so many youngsters at the event that we have decided to put on a special evening event for children only in November. On Friday 26th October we had a fascinating and inspirational talk from Ashley James Fuggle of South East Kent Astronomical Society. Ashley takes photos of the night sky without using a telescope and his images are amazing. Have a look at his photos on his Facebook page. I think we must have an astrophotography competition – what do you think? Afterwards we went up to the observatories and the Phoenix scouts were able to find the North Star as it was reasonably clear.